Spraypaint, subway tunnels, and layers of history. I could be describing Graffiti Archaeology here, but I’m actually talking about something entirely different: an excellent post on the Pruned blog. 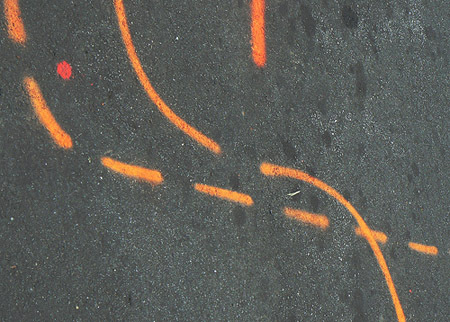 You know those cryptic fluorescent markings you see on streets and sidewalks all over town? They’re surveyors’ marks, and if you know how to read them, they’re a map to all kinds of subterranean structures. Read on.